Please check out the Satellite Multi-Switch Section for similar products!!! This DirecTV approved 4X8 Multi-Switch contains specially designed circuity to optimally interface (RF, DC voltage and currents, channel/satellite selections, etc. )with all DirecTV Dish Antenna Systems and all generations of DirecTV satellite receivers (IRDs). Typical off-the-shelf multi-switches may not be optimally designed for, and therefore may not work properly with all generations of DIRECTV Systems. The 4X8 Multi-Switch is sealed so it can be used either indoors or outdoors. It operates in extreme temperature range from -34 C to +60 C. It contains a power-on indicator to aid installation or troubleshooting. The AC/DC Module is equipped with a re-settable thermal circuit breaker to protect against damage due to shorts during installation. 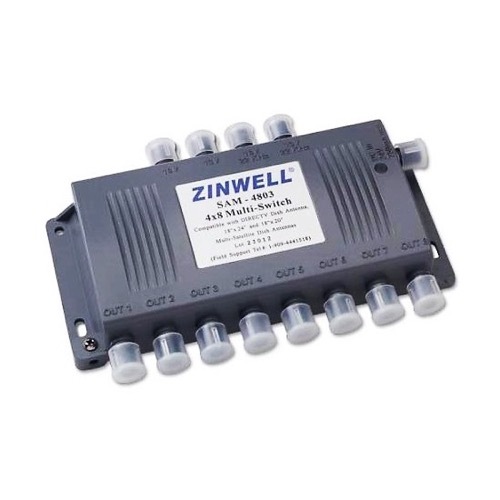 The AC/DC Module is designed for connection to the 4X4 Multi-Switch directly, or remotely via a commonly available RG-6 cable, up to 100'. F-F adapter is included.